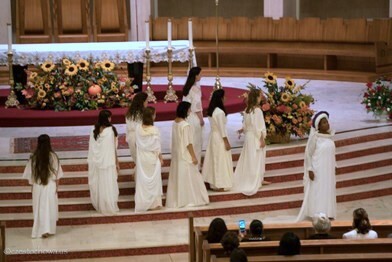 On Sunday, November 8 at 3PM, International Opera Theater (IOT), with nine of their young sopranos from the Philadelphia area and one professional Italian soprano, will present a tribute to Hildegard VonBingen as a child entitled, “Hildegard VonBingen: Bambina Mistica” (child mystic). 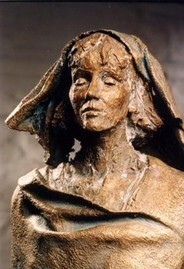 “Hildegard vonBingen: Bambina Mistica”, with original libretto written by Karen Lauria Saillant, based on the writings of Hildegard regarding her childhood, has music by Hildegard, as well as renowned Sardinian sacred music composer, Mariano Garau, had its world premiere in Italy in August of 2015, when the girls and their families traveled there to be part of Assisi Suono Sacro Festival. Singing the role of Hildegard Bambina (Hildegard as a child when she first went to live with Jutta to prepare to become a nun) is 10 year old Isabella Moitoso. Hildegard’s 14 year old teacher, Jutta Von Sponheim, is portrayed by 17 year old Mary Tresvalles who also accompanies the cantata on harp. Today excerpts from Hildegard von Bingen: Bambina Mistica – Child Mystic, music by Hildegard & Sardinian composer Mariano Garau, with text by Karen Lauria Saillant, translated by Maria Luisa Meo, based on writings of Hildegard, with costumes by Micaela Mka & hair by Francesca Rivetti for Harmony for Peace Foundation at Rotwitt Theater, Rosemont College. Andrea Ceccomori’s Assisi Suono Sacro Festival continues in Philadelphia! WIth eternal thanks to so many, especially Daniela Cané Marina Johnston, Marco Bertozzi Christian Bygott & all of our children, their parents, our professional opera singers & friends & family in Philadelphia & Comune di Città della Pieve & throughout the world who make our world peace projects possible! 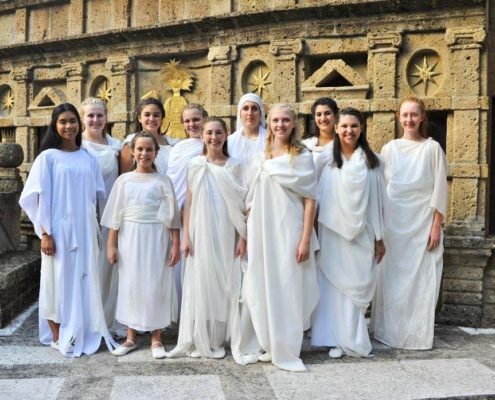 Child Mystic with10 Philadelphia area young sopranos selected from among 75 applicants, for world premiere cantata in Italian and Latin for Assisi Suono Sacro Festival 2015 this past August in Italy. American premiere is this Sunday, November 8 at 3PM at Our Lady of Angels Chapel in the convent of The Sisters of Saint Francis of Assisi of Philadelphia, 609 S. Convent Road, Aston, PA 19014 (610) 459-4125 as part of GlobalPhilly Festival 2015. 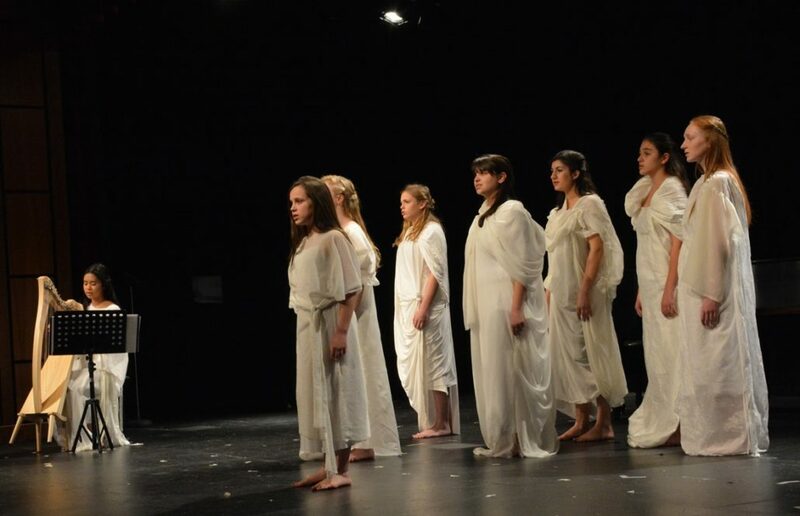 With music by Hildegard and distinguished, living, Sardinian composer, Mariano Garau, the cantata is dedicated to Saint Hildegard as a child and especially inspiring for all young girls. Admission is free and all are welcome. Karen Nitti Moitoso Kim Covello Colleen McCabe Friedman Mary Consoli Daniela Cané! photo by Ornella Tiberi! 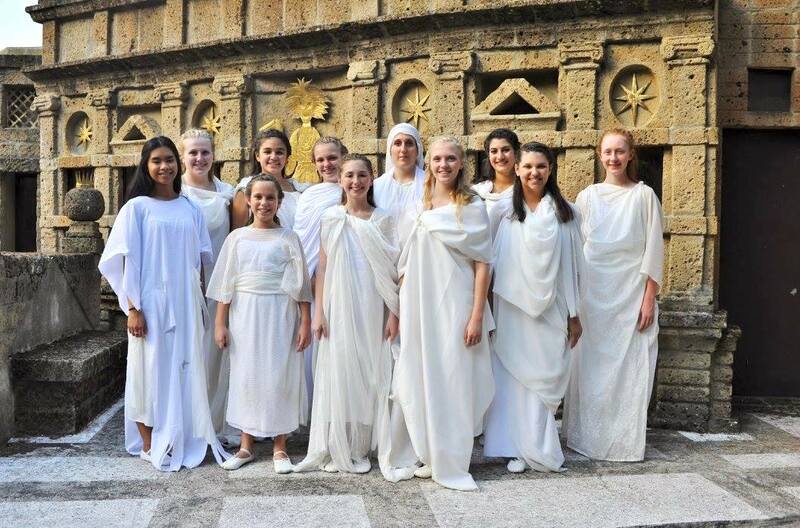 Child Mystic performed by our beautiful young sopranos in front of the porziuncola, which is the cell where Saint Francis died. Still have to pinch myself to believe that we had the most glorious opportunity to sing at the Basilica of Santa Maria degli Angeli this past summer as part of Assisi Suono Sacro Festival! SO many thanks to all of our girls and their families and all of our friends/family members in Philadelphia, Città Della Pieve and throughout the world who made this wonderful project possible! Daniela Cané Andrea Ceccomori Barbara Sklar Carolynn King Richmond Micaela Mka and so many more!!! Child Mystic young sopranos will be singing the music of Mariano Garau for Mayor Nutter, the Vice Mayor of Frankfurt, Germany (newly named Philadelphia Sister City) 11 delegates from Frankfurt and other members of The German American Chamber of Commerce at their Gala this Friday, November 13 at Independence Visitors Center as part of GlobalPhilly 2015. Why is there value in guiding girls to sing humbly? Why is their innate purity important as the place from which their voices should depart. Why does a girl’s voice which is present have so much more meaning than one with intentions to impress? Where does this courage to be oneself originate? To stand so that all may see you. What is it that enables the young female voice, shared in simplicity, to be so powerfully moving, life altering and healing, not just for the girls themselves, but for those who listen? Only a few years ago, Hillary Clinton stated that the rights of females are the “unfinished business of the 21st century”. What if the 21st century girl was able to present The Sacred Feminine in its simple splendor, through her singing voice and humble presence, sharing her feelings and concepts through the natural coordinated vibrations of her own voice- moving simply and in tandem with other like voices, singing music of a composer who shares the same values. Could this presentation impact our world? Could The Sacred Feminine, shared through the hearts of young girls and the music of a humble man, guide us closer to a world of peace and love? International Opera Theater is proud to announce the premiere of a new cantata based on the early life of Saint Hildegarde of Bingen by Sardinian composer, Mariano Garau. www.marianogarau.org This work will premiere in Assisi, Italy on July 23, as part of The Assisi International Festival of Sacred Art and Music in Santa Maria degli Angeli, the Basilica built around the cell where Saint Francis died. Other performances will be in nearby towns, including Citta’ della Pieve on July 24 and 25. 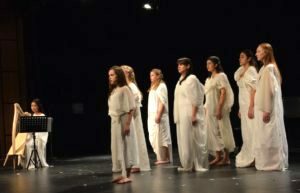 10 teenage girls from Philadelphia will be selected to be part of a training program which will culminate in the presentation of the world premiere of this cantata. Performance is also planned in Philadelphia to celebrate the visit of Pope Francis in September 2015.